The Acropolis Museum in Athens richer and more attractive for the junior visitors. 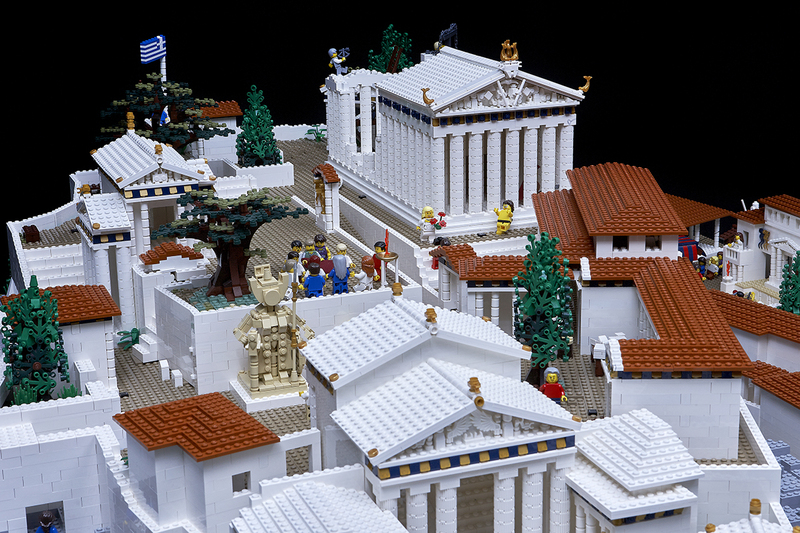 The Acropolis Museum has been enriched with a wonderful LEGO model of the Acropolis, donated to the Museum by Michael Turner, Senior Curator at Nicholson Museum in Sydney, Australia. Visitors, and especially the younger ones, will have the opportunity to better comprehend the stunning monuments of the Acropolis and travel back in time, to the Acropolis of the 5th century BC. 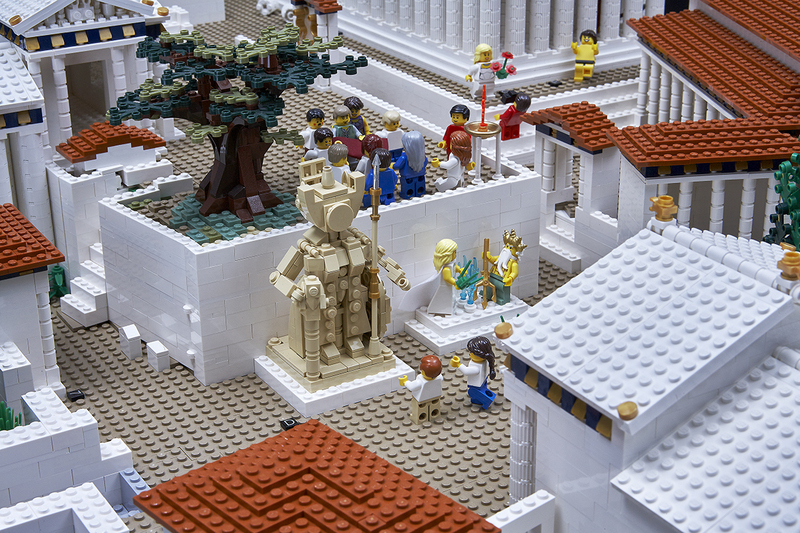 The LEGO model of the Acropolis created by Ryan McNaught, took about 300 hours to be completed and contains more than 120,000 bricks! The landmark of Greece and its most important monument comes closer to the visitor in a funny and playful way. All monuments are represented vivid, colorful and real. Someone can “walk” up to the hill at a glance, coming upon Pericles talking to the Athenians, coming across tourists with their tour guide or watch celebrities, who have visited the cradle of the Western Civilization in a characteristic activity. Freud stares in awe the Sacred Rock, Elton John is giving a concert in the Odeon of Herodes Atticus at the foot of the Acropolis, Agatha Christie is visiting the Acropolis and “King Oedipus” punishes himself by taking out his eyes in a theatrical act at the Dionysus Theater. The Hungarian dancer Nikolska is dancing at the Parthenon in 1929, wearing a see-through dress, while Lord Elgin and his crew are removing the Parthenon marbles! The presence of Melina Merkouri, a Greek actress and politician, the woman, who struggled and fought for the return of the Elgin marbles or as we call them the Parthenon sculptures, couldn’t be missing from the set. 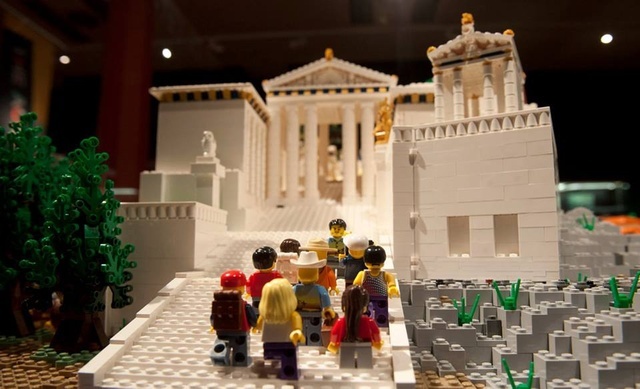 More than 100.000 people visited the Nicholson Museum, where the LEGO model of the Acropolis of Athens was first displayed, to admire it. That caught the attention of the Acropolis Museum, which asked to borrow the exhibit for some time to display it in the same ancient place it depicts. Michael Turner, Senior Curator at the Nicholson Museum, thought about it a lot and after a sleepless night, he decided to donate it to the city, which inspired him to create it. 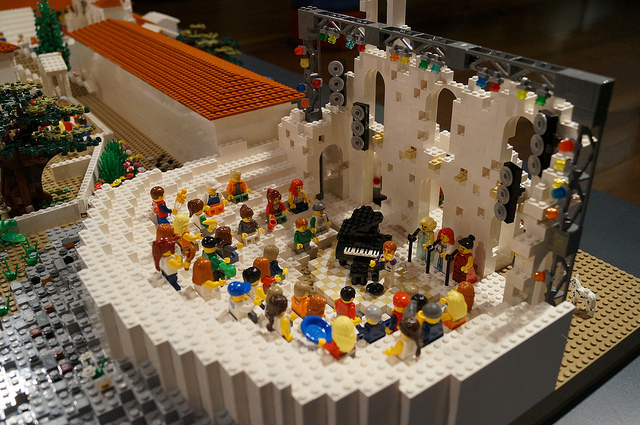 The LEGO model arrived in Athens in July 2014 and since then lives beneath the real Acropolis of Athens! A group with their guide in Acropolis. An Athens Walking Tours group maybe? 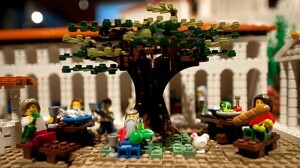 The museum of Acropolis is planning a variety of interesting programs for kids. Children will get the chance to play with LEGO bricks similar to those used for the LEGO Acropolis. It would be a great opportunity to visit Athens with family and enjoy a wonderful Acropolis museum tour with a licensed, highly qualified guide. 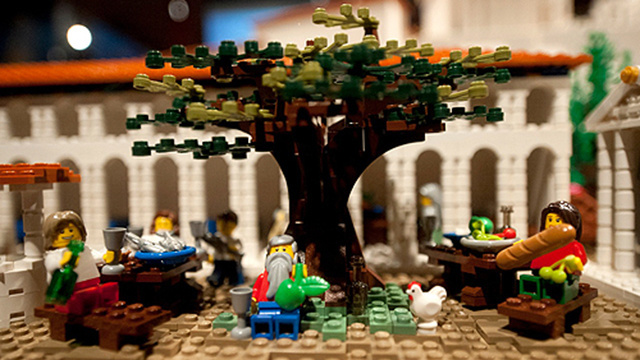 The LEGO Acropolis is located in the second floor of the museum, next to the restaurant. This entry was posted in Acropolis, Acropolis Museum, Athens city sightseing, Athens News, Athens Walking Tours, Athens Walking Tours News, Modern Athens and tagged Acropolis, Acropolis Museum, Athens, Athens sightseeing, Athens tours, Attica, children, Greece, guide, kids, LEGO, LEGO bricks, news, nicholson museum, Ryan McNaught, Tours. Bookmark the permalink.